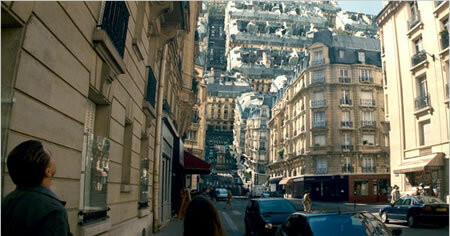 The Architecture, the Mind and the Memory: Notes on the Production and Place Design of "Inception." Ariadne: How could I ever acquire enough detail to make them think that it’s reality? Cobb: Our dreams, they feel real while we’re in them right? Its only when we wake up then we realize that something was actually strange. 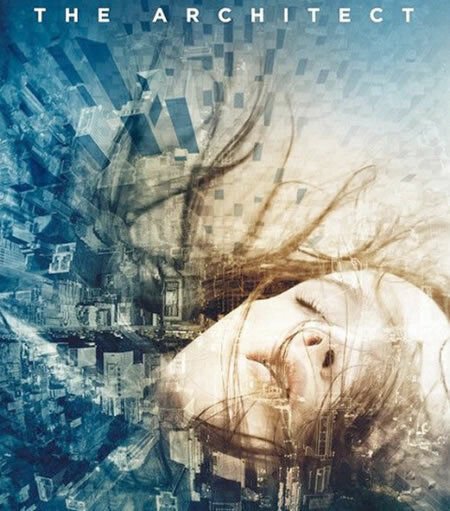 Is the concept of the architect a designer of place that could be the realm of dreams? 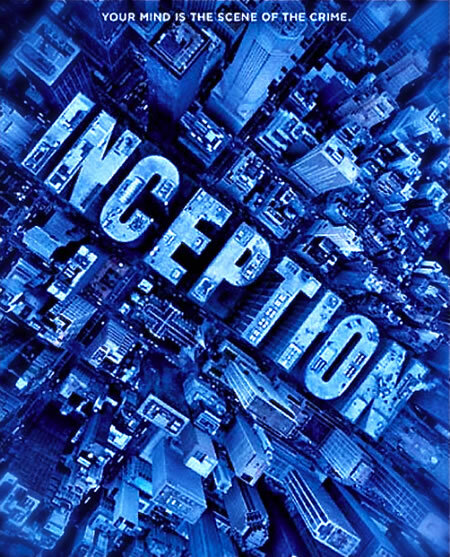 I found the character of Inception to be intriguing — labyrinthine and sinuous — in the layering of dreams and imagination. 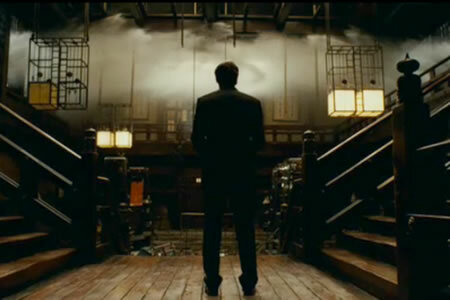 I might credit Christopher Nolan for the fascination with the concept of looking more deeply into the human psyche — from “Following“, to “Memento,” “Insomnia,” “The Prestige,” to his (soon to be three) treatments of the Batman legacy (and the first time, the psychological presence of not only the concept of Bruce Wayne, but as well, to his villainous antagonists). 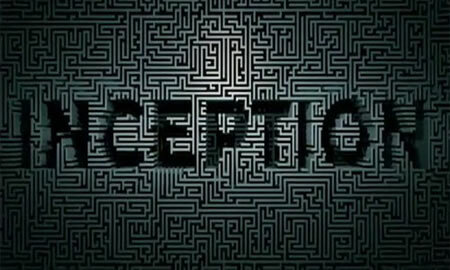 But to “Inception” there was something different — another depth. 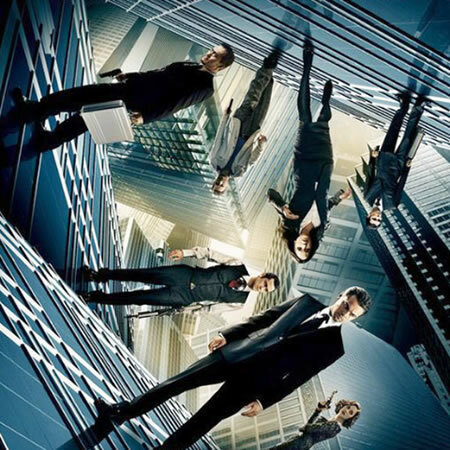 I realize that the audience response is split, but I applaud the Nolan brothers’ move — a risky jump into cerebral place, from the winning legacy of the billion dollar, Batman money making franchise. But I was compelled by the proposition. Watching it several times, I learned more — and contemplated — of the increasing drop into the layers of the mind — and story — and complexity of the Nolan brothers explorations. It’s an art, like the patina of a washed drawing, or the waxed portraiture of encaustic imagery, there are things that are seen, in scene, and elements that lie beneath — the treatments of chiaroscuro and palimpsest. Light and shadow, with the hints of color seeping into the edge of the mind — and writing that is on writing (now scribbled and scratched away, newly revealed). 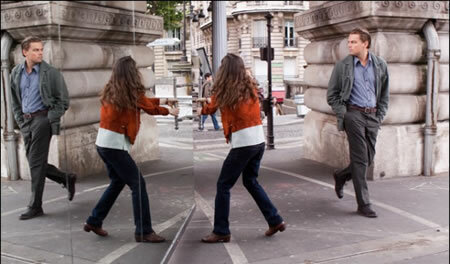 I can recall a time just arriving in Paris, after the airport, running into the city — a Sunday morning. Being one to venture out immediately on arriving, the idea of restlessness of the weary traveler becomes worn in the new hunt of exploration. Still heading out into the city — 8th Arrondissement — I wandered the old streets: mist set in. And without the sun’s location, my perpetual compass — I was lost. Wandering the Haussmann-style turns, corridors, buildings and lanes, I walked further into the fog — completely lost, in a dream. Weary, travel dizzy, it was a little alarming. Finally, Place Concorde emerged in the earthbound clouds and I found my way back. 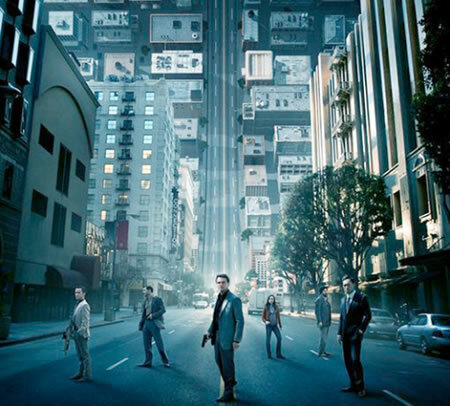 But the combination of those elements reminded me of the moments of “Inception” in the unfolding dreams of that imagery — streets turning up, curling in the planning of the architect’s dream, the designer of the maze. 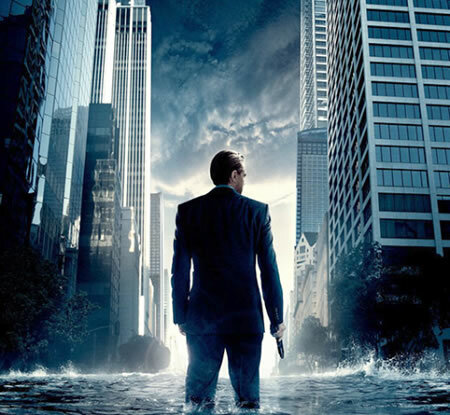 It’s far too complicated to relate the telling of the film’s narrative — the nature of the theft and implanting of dreams — and the deep dive into the layers of that voyage. See it, or more here. But what I found compelling was the bridge between the mind, memory, dreams and ideas — and the designing of labyrinthine mazes, built dream environments, to search and seek out the inner reaches of the mind and memory to implant ideas that could change the course of certain “decisions” — in the story, corporate choices that could influence the chess mate of enterprise battle. 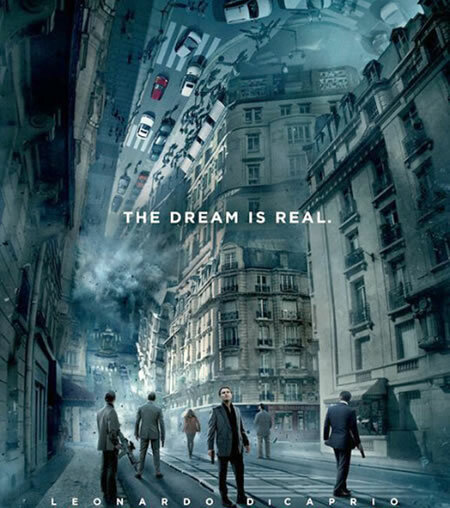 That aside, the nature of designing dreams for inception requires an architect — a person to build out the worlds that will influence the play of the game. Another story, to the idea of the dream of place, labyrinths, minds and mystery, Umberto Eco’s telling of “The Name of the Rose” spoke to another uncovering, set in the medieval times. 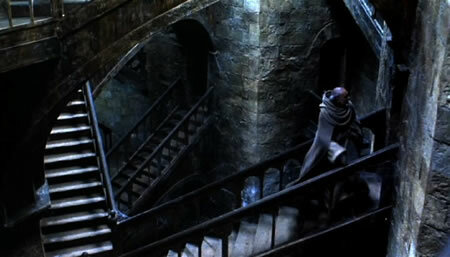 The setting, a monastery, a string of murders, an investigator, a library that is a maze and a poisonous scriptorium. 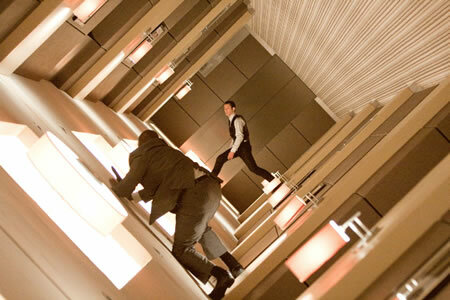 Studying that story, and watching the film, I was reminded about the idea in seeing Nolan’s effort. Interestingly, we partnered with the designer of those sets, Dante Ferretti, in creating Rosi — a NYC restaurant. 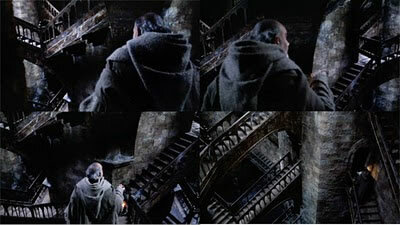 But in these images, the idea of the circulation being baffling, dream-like and bewilderingly gravity-less, stairs on stairs — ascensions and descending movements — that mix and match the darkened subconscious perspective of the journeyer, aligns the idea of architecture and the design of the places of imagination. Jorge Luis Borges, the Latin American author and poet, might be another examiner of this layering of content, consciousness and the design of maze-like journeys. 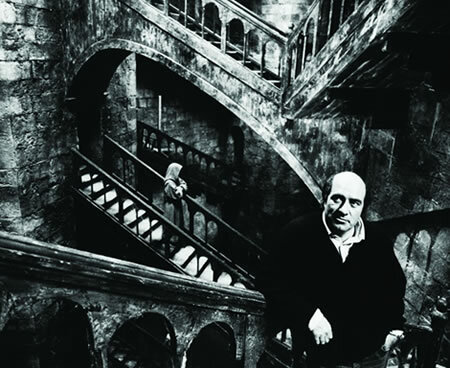 In his world, and his work, the layering of his storytelling takes on the spirit of the Piranesian construction (an Italian artist famous for his etchings of Rome and of fictitious and atmospheric “prisons” — Carceri d’Invenzione) — which layer is up, which back, what path forward, what way — down? That world-bending, scene-imploding, shifting of the mind / physical character of “Inception” might be evidenced in the drawing imaginations of this artist — or in the current cinematic scene — the journaled work of Guillermo Del Toro’s Pan’s Labyrinth. The gesture is the idea of creating spaces — building places in the mind that layer and sequence the character of the dream. There, the quality of thinking through the dream — and place — find further concretion in the Nolan brothers’ vision. 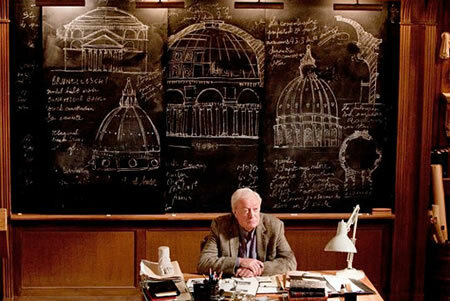 The nature of the architecture, the actual “designing” of it, comes from the production designer, a physical interpreter of the visioning of the narrative. The visualization comes in the phases of opening planning meetings (this, my interpretation in being “in” on the process in other films,) then a hand in hand working engagement to link script and physicality together into a seamless interpretation of storytelling. 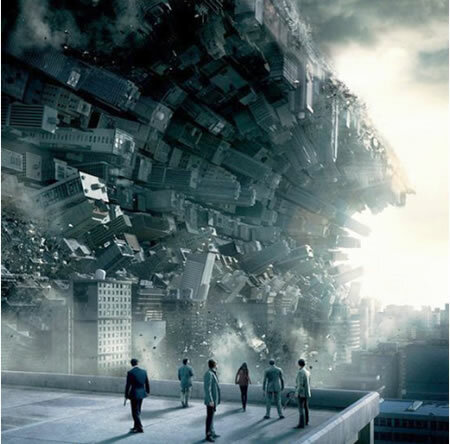 Corbould’s teams, for instance, built giant rotating hallways and a massive tilting nightclub set to film the startling “Inception” scenes when dream-sector physics take a sharp turn into chaos. One of the film’s stars, Joseph Gordon-Levitt, spent long, bruising weeks learning to fight in a corridor that spun like a giant hamster wheel. 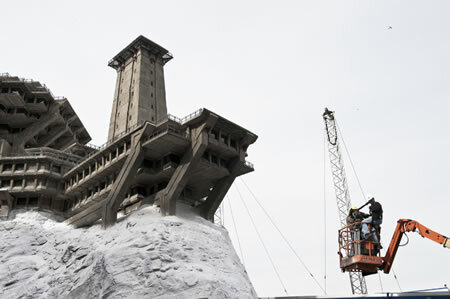 Kennedy continues, “An example of a set that was completely built, though it would be computer-generated in most films, was the snow fortress. “We wanted it to look realistic,” Dyas recalls. “So we entirely built an 80-foot tower – 400 feet across by 500 feet deep.” But in the Alberta mountains, he was panicked about how to pull this off while also not being able to put concrete foundations down. “I got myself a drink and looking down in the glass, I thought I should fill foundations with water and let it freeze – and we did it! 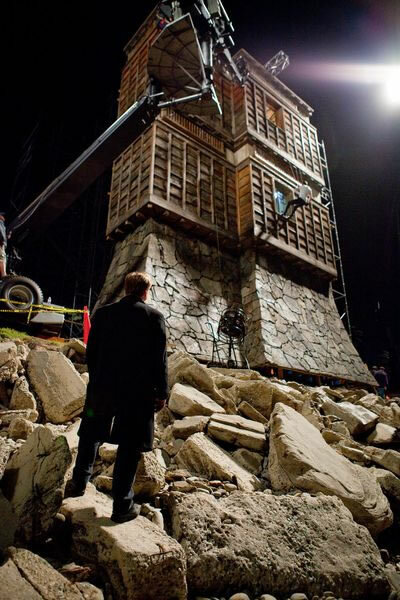 We had a situation where we had built not only a set but a campus from where to work from,” he says. 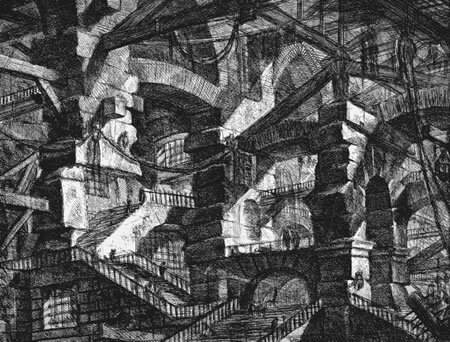 The idea of the architecture of place-making, and dreaming the dream — the palace of the magical memory — is an allegory of ancient perspectives — architecture mirroring the mind. The allegory of place — designed — with mind and memory aligned, the path of the deep dream, and the secrets of their telling. Amazement — to the heritage of the maze itself. As a designer of place, what is the unfolding of the dream, the layering of the library of the mind’s memory, in experiencing the physicality of the unconscious? 10 Billion Apps and the first stroke of inspiration.